Congratulations to Michael, winner of yesterday's Person-of-Mystery contest! 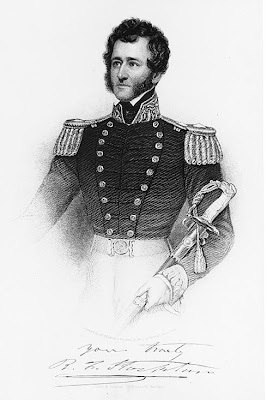 He correctly identified Commodore Robert F. Stockton. California history was on my mind last week as September 9th was California Day. The Golden State was admitted to the Union on September 9, 1850, and Commodore Stockton had a large part to play in the process. 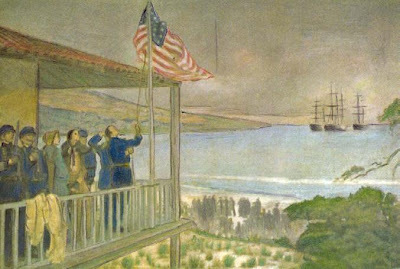 Hearing that war with Mexico had commenced and fearing a British takeover of the nascent California Republic, Commodore John D. Sloat, raced the United States Navy's Pacific Squadron to Monterey to declare California part of the United States. Only a week after the uneventful flag raising in Monterey, poor health required Sloat to relinquish command to Commodore Stockton of the USS Congress. Now the commanding the largest American force in California, Stockton pursued the retreating Mexican forces to Los Angeles and relieved the besieged forces under the command of Stephen Kearney at San Pasqual. 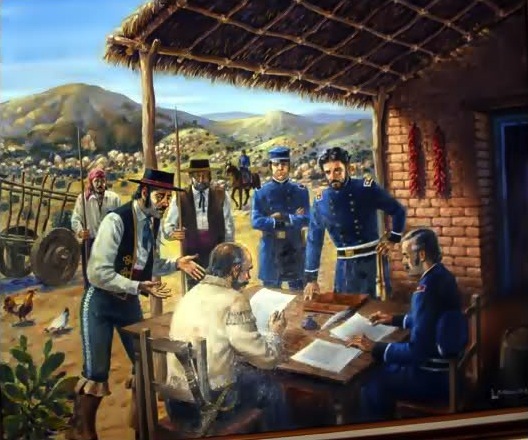 Stockton then defeated the Mexicans at the battles of Rio San Gabriel and La Mesa, forcing the remaining Mexicans to surrender all of California under the Treaty of Cahuenga. Following the war, Stockton was elected as a US Senator from his home state of New Jersey. 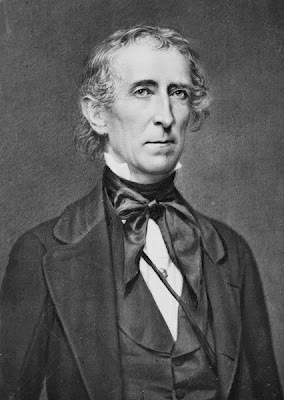 Although, he is best known for his actions during the Mexican War, there were two rather unsuccessful 'peacemaker' incidents in his life, which should be noted, both of which also involved the tenth president, John Tyler (who was also on my mind after the comment by Robert on my earlier George Washington Parke Custis post). John Tyler was a highly unusual president. He was the the first vice president to become president after the death of a former president. He was the first president to have a first lady die and the first president to marry while in office (he also had more children than any other president - 15). He was also the only president to serve in the government of a foreign nation after his term. And as Robert pointed out earlier, Tyler is the earliest President to still have living grandchildren (two of whom are still alive today). Tyler also came very close to being the first president killed while in office. On February 28, 1844, President Tyler, along with many of his cabinet members, his fiancee and her father, former first lady Dolley Madison, and many members of Congress and important dignitaries were aboard the US Navy's first screw steam warship, the USS Princeton, for an trial run down the Potomac River. 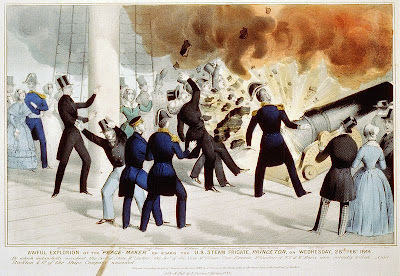 The then Captain Robert Stockton, was encouraged by his guests to offer a one last demonstration firing of the 12 inch main gun, nicknamed the "Peacemaker," Stockton himself designed. Tyler was invited up on deck, but remained below to have a few drinks with some of the guests. 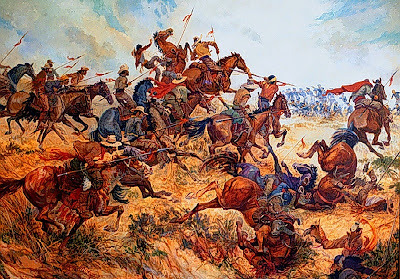 Up above, Stockton's gun was again fired, but exploded and sent shrapnel into the crowd, killing six including Secretary of State Abel Upshur, Secretary of the Navy Thomas Gilmer, and Tyler's future father-in-law David Gardiner, as well as injuring twenty others. Stockton was brought before a Court of Inquiry and exonerated, many think to his earlier support of President Tyler's campaign. Later in life, Stockton's paths would again cross with Tyler when the two were both delegates, Stockton from New Jersey and Tyler from Virginia, selected by their respective states to attend the Peace Conference of 1861, an unsuccessful last-ditch effort to avert the Civil War. 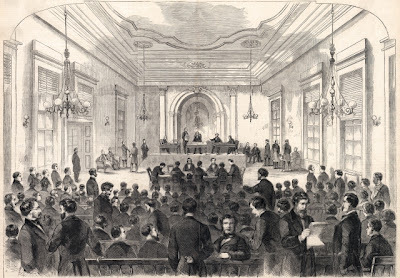 The Conference ended without compromise and the men returned to their respective states, former US President Tyler eventually was elected to the Confederate House of Representatives. Stockton was asked to lead the New Jersey State Militia when Lee's Army was in Pennsylvania, but it wasn't needed after Gettysburg. Stockton died in 1866 and is buried in Princeton, New Jersey. I have a question for you. An old newspaper (10-3-1918) asks citizens to save shells & fruit pits for gas masks for soldiers. What is the connection? Never mind about the fruit pits & gas masks. Roger RTD told me. Judi, actually President Tyler, who died in 1862, has two living grandchildren. Tyler's first wife, Letitia Christian, died in 1842 when Tyler was 52. They had eight children. He then married secondly, Julia Gardiner, in 1844, Tyler was 54 and Gardiner was 24. Tyler had seven more children with his second wife, who was thirty years his junior. One of these children, Lyon Gardiner Tyler (1853-1935), like his father, also married a much younger second wife after the death of his first. 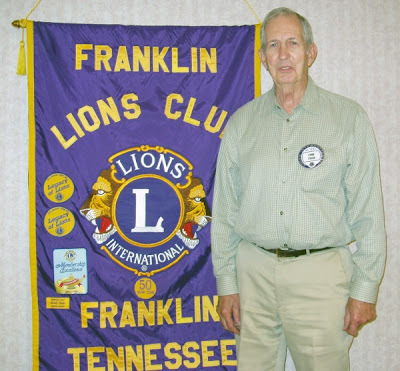 Sue Ruffin was 36 years younger than Lyon. They had three children. One died at birth, but the other two are still living: Lyon Gardiner Tyler, Jr. (b. 1924) and Harrison Ruffin Tyler (b. 1928). The younger of which still lives at Sherwood Forest Plantation, the Tyler Family home about 18 miles west of Williamsburg, Virginia. Judi, the fruit pits and nut shells were burned to produce charcoal. WWI vintage gas masks used canisters of crushed charcoal as the air-filtering agent. These collection efforts (paper, rubber, metal, grease, etc...) during war time were a way the home front could support the troops.